Creating complex parts from hard metals is a specialty of JWD Machine Inc. The company, located in Fife, Wash., works with some of the largest aerospace manufacturers in the world. The a81M machines have delivered the power and precision needed to hold repeatability of 0.00025 to 0.0005 inches in hard metals. It has helped the company eliminate 80 percent of previous boring operations. In the past, these kinds of speeds and feeds would have damaged tools or shaken its machining platform. Now productivity has been increased by 25 percent, and tool expenditures have been reduced by 15 percent. The PS95 machines have contributed the power and rigidity to handle hard-metal applications with ease. The performance of a 50-taper machine is delivered in a 40-taper package, decreasing cycle times. Similarly, the D500 5 axis vertical machining center has provided the ability to handle intricate features accurately, with improved quality and fewer setups. 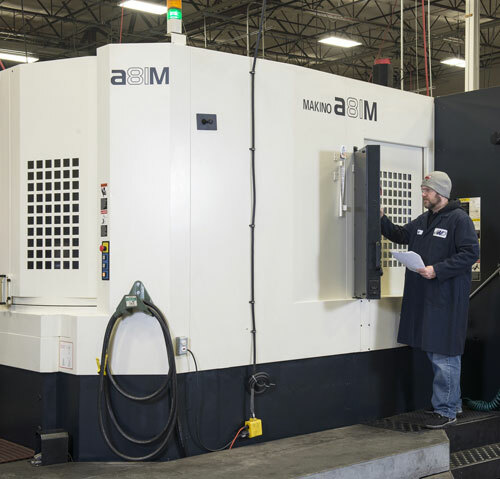 The two a61nx horizontal machining centers, coupled with the MMC2, have enabled the company to run its titanium milling operation unattended at a lower cost per part. On a job transferred from the company’s other automated system to the a61nx machine, cycle time was decreased nearly 70 percent. Additionally, employees have been redeployed to other areas of the shop to further increase JWD’s efficiency.